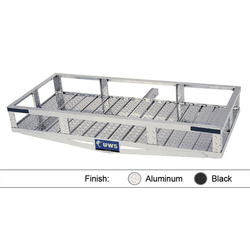 Carries up to 500 pounds*, provides rust-free design and delivers a sleek, stylish appearance through its Heavy-Duty Aluminum Beam Platform Floor and Top Side Rail. *Load capacity SHOULD NOT exceed the vehicle manufacturer cargo and/or entire vehicle capacity rating. Consult vehicle manufacturer for capacity ratings.